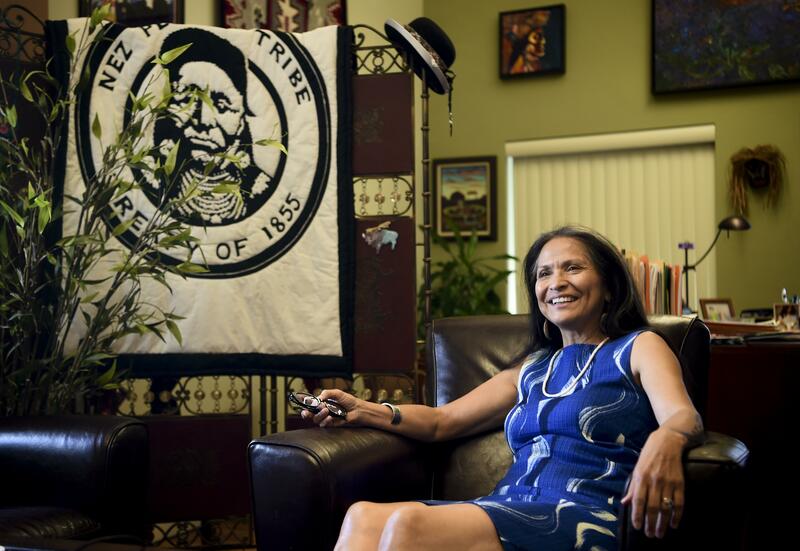 Mon., Aug. 8, 2016, 5:53 p.m.
JoAnn Kauffman, a prominent Nez Perce Tribe member and national Native American rights activist, was recently selected to be featured in the secretary of state’s Legacy Washington project. The “Who are we?” program highlights a group of Washingtonians with stories about their lives and an interactive exhibit in the state’s capital. The project focuses on people who have had a positive impact on their community. Kauffman, who grew up in Seattle and moved to Spokane in 2000, is the subject of a nearly 5,000-word profile on the secretary of state’s website. She’ll also speak at the exhibit’s opening ceremony. The profile took months to write and required multiple conversations with Legacy Washington’s director, Trova Heffernan. Kauffman said Heffernan’s profile was so in-depth that she actually learned about family members she’d never heard of before. As a member of the Nez Perce Tribe, Kauffman has spent most of her life between Seattle and rural Idaho, where her grandmother owned a house. She began advocating for Native Americans in the early 1980s, when she met her husband, Tom Keefe, a former legislative aide and a Democratic candidate for Congress in 2000. Keefe and Kauffman, who elected to keep their last names, work side-by-side at her professional services firm on South Howard Street, Kauffman & Associates. In 1990, she started the “one-person shop” in Washington, D.C., and in 2000 opened a second location in Spokane, where she lives with Keefe. The majority of Kauffman’s clients are federal agencies, including the Department of Education and the Department of Homeland Security. Some current projects include a campaign to educate Native Americans across the country about the Affordable Care Act, and reducing violence against Native American youth. The profile and exhibit, which opens Aug. 25 in the Capitol building in Olympia, focus heavily on Kauffman’s motivation for devoting her life to advocacy. And at age 63, she shows no sign of slowing down. Published: Aug. 8, 2016, 5:53 p.m.